Ideal where in-ground anchoring devices are not appropriate. Saddle-bag design rests over the rear frame to provide necessary counterweight. Vinyl bags are filled in the field with 50 lbs. of dry sand. Nylon strap design. (May come in different colors). Set of 4. New Exclusive Design! 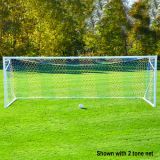 Powder coated, all aluminum, portable goal offers a full ground base frame and exclusive 1-5/16" O.D. European and auxiliary backstays. Features exclusive flush mount Easy Track™ net attachment system and stainless steel hardware. Round goals have 3" O.D. extruded frame. All NOVA Club goal packages come complete with one pair of goals, 4" square mesh white nets for safety, Easy Track™ net attachment system and auger anchors. Optional wheel kit available for easy mobility available separately. 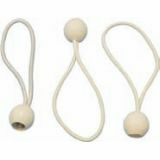 Replace old and worn bungees. White, 6" long. Comes in bags of 30. Two bags are required for the Medium Rebounder STGRB718 and three bags are required for the Large Rebounder STGRB824. New Exclusive Design! 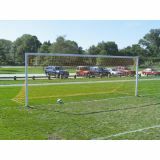 Powder coated, all aluminum, portable goal offers a full ground base frame and exclusive 1-5/16" O.D. European and auxiliary backstays. Features exclusive flush mount Easy Track™ net attachment system and stainless steel hardware. Square goals have 4" x 2" extruded frame. All NOVA Club goal packages come complete with one pair of goals, 4" square mesh white nets for safety, Easy Track™ net attachment system and auger anchors. Optional wheel kit available for easy mobility available separately. International style, all aluminum goal. 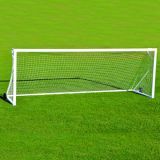 Official size 8' H x 24' W x 4' B x 10' D. Powder coated goal is 4" O.D. extruded aluminum with a 2" x 4" base frame, 1.7" O.D. 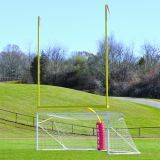 aluminum European and auxiliary backstays and an infinitely adjustable rear crossbar allowing the goal to fit under any football goal post. Features exclusive flush mount Easy Track™ net attachment system. Meets NFHS, NCAA and FIFA specifications. 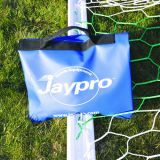 Ground anchors, wheel kits and nets available separately. A Military Favorite! 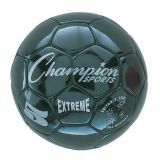 Official size 8' H x 24' W. Powder coated uprights and crossbar are 4" O.D. 14 gauge steel. Designed without backstays for permanent/semi-permanent installation. 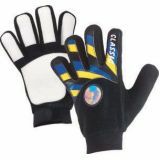 Includes nets, net clips and net pegs. Ground sleeves for semi-permanent installation available separately. International style, all aluminum goal. 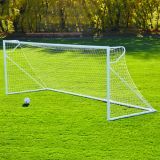 Official size 8' H x 24' W x 4' B x 10' D. Powder coated goal is 4" O.D. extruded aluminum with a 2" x 4" base frame and 1.7" O.D. aluminum European and auxiliary backstays. Features exclusive flush mount Easy Track™ net attachment system. 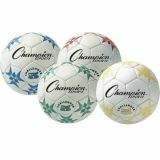 Meets NFHS, NCAA and FIFA specifications. Ground anchors, wheel kits and nets available separately.